Home > E Number Basics > Where are E Numbers Found? So you’re clued up on what all these strange E numbers are, but where are they actually found? In more foods and drinks than you may well imagine. E numbers are widely used in foods today and crop up in the most surprising products. Manufacturers love them, as the different types of E numbers each play a useful role in the production, manufacture and preservation of foods, helping improve the colour, look, taste, thickness and longevity of many items. 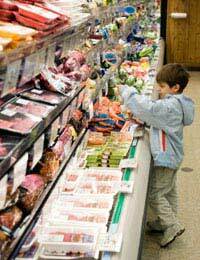 In fact, E numbers are used in the large majority of processed foods available on the shelves of supermarkets today. But even seemingly non-processed foods contain E numbers too. Take tinned fruits or vegetables for example. These count as one of our daily portions of fruit and vegetable each day, but it’s amazing to think that E numbers are included in these products – especially when you’re buying fruit in its natural juice or potatoes in water. Even something that seems as innocuous as frozen fresh fish or cheese has the odd E number included in it. Of course, it’s good to keep in mind that not all E numbers are artificial – some are obtained from natural sources – so their presence in foods may not be quite as strange as it may seem at first. Here are just a few examples of some commonly used E numbers and the foods you’ll find them in. When you’re next out shopping, take a moment to look carefully at the ingredients labels and see if you spot any E numbers in foods where you didn’t think they’d occur.